5 acres! Sits high with a great view of the countryside and oh the star view... simply wonderful. Paved roads!!! Pond! Treed! 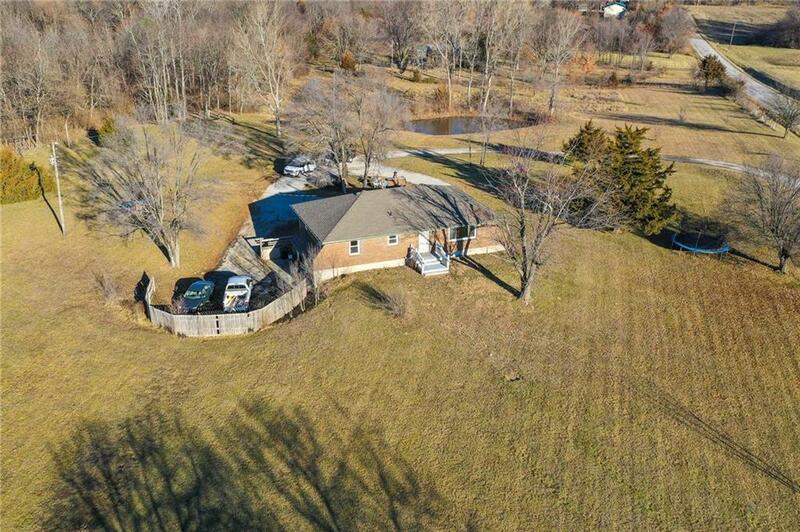 It's hard to find 5 acres or more in this price range so come out, imagine the possibilities... build your own barn overlooking the pond, sit under the tree cluster and enjoy the simplicity! Best feature of this property is the circle drive that goes right up to the deck without all those steep stairs schlepping your groceries from the garage. Love Chip & Joanna? This is it! Directions: 49 South to Peculiar Exit. Right on C. Follow C around and go left at the split. You'll be on the outer Rd going south past Sioux Chief. Right on Miller Rd. Right on E 251st St. to Stark Rd. Left on Stark to property on the corner of Stark and 253rd. From Harrisonville: 2 HWY. West then Right on E 263rd St. Right on Stark to Property.